I love these pancakes! They are so easy to make, flavorful and super versatile! I have made them with both blueberries and raspberries! This is definitely a hubby approved and requested recipe! Mix together all the wet ingredients in a large bowl. Place about 4-8 blueberries on the top of the batter while cooking. Devour with maple syrup, honey, cinnamon or yogurt topping. This is great with any fruit! 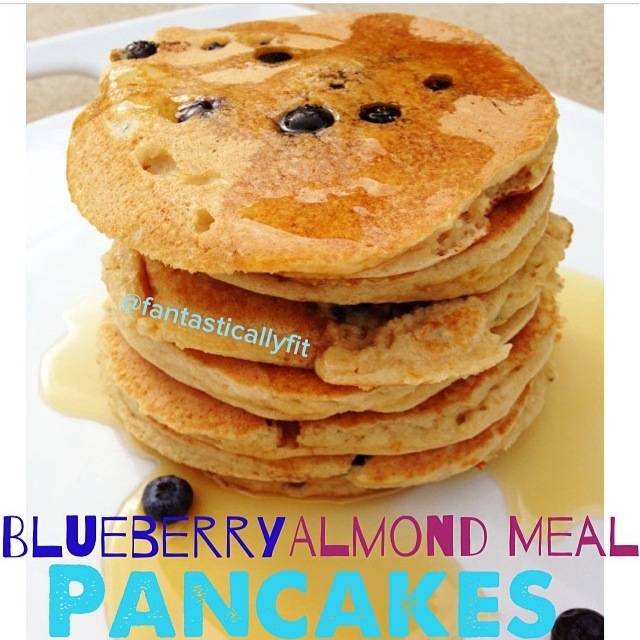 0 Responses to "Blueberry Almond Meal Pancakes"
This sound AMAZE, and the ingredient list is manageable. I lose interest when the ingredient list is too long to tackle! Thanks for sharing! My boyfriend loves pancakes but I have to go gluten free so this is a win win! Awesome so glad to hear that! I promise they are sooo easy and sooo good! Hi! I have never frozen them (they always get gobbled up in my house). If you freeze them let me know how it goes. Hi Amy. We have egg allergies so when I have tried to experiment with almond meal pancakes they don’t come out light and fluffy. Do you have any alternatives? I don’t like the idea of commercial egg replacers, too many unknown nasties. Thank you. You could maybe try flax eggs and see if that works? Or apple sauce.